 <30-Apr-02>: webWiz has been spending some spare time being engrossed by the AutoPack set of activities. There's enough traffic to keep you busy and the sidings have some interesting loose consists. Best of all, the computer doesn't slow to a crawl at any stage. So it's worth installing the Auto Train from the SCL-CSX A-line site.  There's a page here (or use the menu table on the right of each page) to give you some tips on installing the Auto Train.  Also, there's now a page of background snippets about U.S. and Australian railways.  <29-Apr-02>: New to the Train-Sim.com file library is the Canadian Pacific Rail 1955 classic train set. Don't be disappointed at the file size (35Mb) if you only have a dialup connection! You can download it as seven 5Mb separate files from the 1955 Canadian Pacific Classic site. Always keen to find new activities, webWiz saw an Auto Train one (autopack.zip) at Train-Sim.com. Extra rolling stock is required from the SCL-CSX A-line site, all contained in the Auto Train download (autotrain.zip, 13Mb). This download looks like being a little messy to install, so expect a few tips in a day or two. Also at Train-Sim.com, there are a set of UP Turbines (4500_nt.zip, prrr8500.zip) and young Bill Hemb's - he's 17 years old - Amtrak '70s era F7 loco pack (amlocos.zip).  <27-Apr-02>: Downloads that have caught webWiz's eye over the past couple of days (from Train-Sim.com): TGV cab, tgvcab2.zip (2.5Mb, 25-Apr-02), a well-rendered cab for your TGV trainset; Auto Train 3-part activity across Marias Pass, NEC2.0 & OWVRR routes, autopack.zip (760kb, 25-Apr-02; you'll also need loco SCL1776 & the Auto Train set from the CSX A-Line site). For those of you designing a route, a large number of scenery objects, including water towers, buildings and bridges, have been contributed to the Train-Sim file library over the past couple of weeks. TrainArtisan have re-designed their site and their free products can now be downloaded from one page: the CWAC60 locos set (including one in BHP Iron Ore livery), VIA passenger set, SD70 locos and hoppers set, RS11 Alco locos set.  <26-Apr-02>: Update to VIA F40PH #6402 loco (via_f40.zip, 24-Apr-02, 12kb) at Train-Sim.com.  <25-Apr-02> webWiz downloaded and installed a set of revised sounds for the Acela and HHP-8 locos. They certainly add more realism: wind noise as you drive faster, brake rumble when applying the brakes, and under about 10mph when coming to a stop, there's a gentle brake squeal. 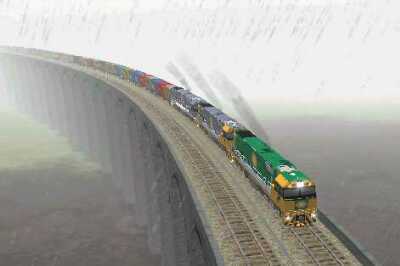 The file to download is elecsnds.zip (360kb, 07-Apr-02) from Train-Sim.com. A reminder that the Train-Sim.com Message Areas are a rich source of information. The MS Train Simulator message area is worth a visit on a daily basis. More specialised message areas are: Loco Design, Engine & Livery Skinning, Route Design, Activity Design, Cab Design and Sound Design.  <22-Apr-02>: Steam4Me, the site for Australian rolling stock, has some new downloads: a NSWGR #4201 loco & a TraileRail Roadrailer. For the time being, you'll find the Dekosoft site at http://dekorats.com/design/msts/index.html. There's a page added here describing the construction & history of the Settle-Carlisle route. At the Microsoft TrainSim site, there's a Dash 9 with the MSTS logo for free download (the download contains a new graphic and instructions so you can change back to the original). Also, at the Microsoft site, you'll see that the update to MSTS has been broken into two parts for easier downloading. webWiz hasn't taken the plunge yet and installed this update - you can read many different points of view on the Train-Sim.com message board (do a search on update to find plenty of posts). Line news for March is now on its own page.  <20-Apr-02>: Downloads from Train-Sim.com over the past few days include: two VIA F40PH locos (via_f40p.zip, 14.6Mb) which use NALW's work from the gen paks; updates to the P2-1 & P2-2 steam locos; Canadian Pacific "Jubilee" 4-4-4 steam loco (Canada's fastest). Here at webTrainSim, there's a page describing engine modifications to the Australian NR class of locos (download from Australian Add-ons to MSTS).  <19-Apr-02>: For a first-hand account of what's involved in driving a steam loco, read the article about Victoria's Puffing Billys in the April edition of Railway Digest, published by the Australian Railway Historical Society. This edition also tells us that the Toll/Patrick consortium will be naming the former National Rail/FreightCorp groups as Pacific Australia.  <18-Apr-02>: There's now a sample ENGine file to browse from the ENGine, CabView File and sounds page. The Timesaver route is worth downloading from RailwayStation.com - a route in only a 60kb download.  <16-Apr-02>: To save you some time finding the best downloads, and locos that are easy to install, browse through what the NALW have made available over the past few months for the MSTS community. Some downloads from Train-Sim.com: a schematic set of maps of default routes as JPEG graphics, sized for printing: ts_maps.zip (3.2Mb, 15-Apr-02); a cabview for Chris Longhurst's EuroStar: estarcab.zip (1.9Mb, 14-Apr-02); first UK Pacific Class, the "Great Bear": grtbear1.zip (930kb, 14-Apr-02).  <13-Apr-02>: Added a page to show how you can add some variety to your activities, using ConBuilder and ActivityChanger. A reminder to visit the Train-Sim.com message board to add your suggestions for bug fixes and enhancements to future versions of MSTS.  <12-Apr-02>: Two new pages added: a list of essential sites (i.e., visit these daily) and others, including references; a second page with "small fixes", tips to help you install some rolling stock. Downloads from Train-Sim.com over the past few days: version 3 of an improved cab for the default GP38 (and others you have in your roundhouse; can be also used for SD40s). To get the GP38 cab working, I needed to edit the GP38J.cvf cabview file to insert double quotes around the graphics file names - click here to read the steps on the Small Fixes page.  <10-Apr-02>: webTrainSim moved here, to http://webDotTrainSim.tripod.com. Add this new address to your favourites.  <10-Apr-02>: Some downloads from Train-Sim.com over the past few days include: improved Acela and HHP-8 sounds by Joseph Realmuto (wind, brake squeal and rumble, quieter air compressor), elecsnds.zip; an activity for Marias Pass 3.0, ext2021.zip; revised wagons for Boeing 737 fuselages and parts (b737car.zip, bbox.zip, tailcar.zip, skybox.zip, clabbox.zip); parlour/observation wooden passenger car, with view from the back platform (obsvrcr2.zip); Kurt Kaminer's BNSF Dash-8 loco, bnsfb40.zip and update b4011upd.zip.  <05-Apr-02>: With the release of NALW's Genesis loco packs, there's no further need for the page on making the default Genesis loco into a driveable one so that page is now titled NALW Genesis locos. Make sure you get the full CW60AC pack (6.5Mb) from Train Artisan - it includes the one in BHP livery (the correct download server is www.inevitable.com). New downloads from Train-Sim.com over the past few days include: Green Goat diesel-hybrid loco, Stannier Coronation Pacific "City of Manchester" steam loco, ex-VR 1910 carriage (now on Mornington Tourist Railway), Track Repair loco, updates to the Silver Streak locos and passenger car set.  <04-Apr-02>: Train Artisan announces the CW60AC locos pack (including one in BHP livery) and SD70 locos pack (as well as an update to V1.1) for download. A page is now available for step-by-step instructions to show you how to use 3D Train Stuff's cab and sounds with your Train Artisan SD70s; click here.  <01-Apr-02>: Added a page to describe how to improve your MSTS experience by changing the field of views for the various cam shots (e.g., the view from a loco's cab and the coupler view).